Mangaluru, Aug 18, 2018: A team of doctors lead by Dr Sripada G Mehandale, Coordinator of Resuscitation Training Cell, KSHEMA, Nitte University imparted cardio-pulmonary resuscitation skills to interns, postgraduate students and staff of KVG Dental College and Hospital, Sullia, in 17th August 2018. 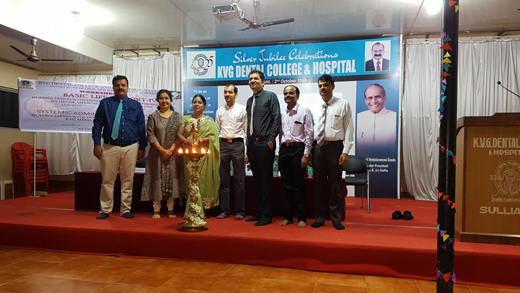 Dr Moksha Nayak, Principal, KVG Dental College and Hospital, inaugurated the workshop. Dr Ramraj, Professor and HOD, OMFS, organised chairperson welcomed the gathering, while Dr Mahabaleshwar Bhat, Professor of OMFS, proposed vote of thanks. Dr Prasanna Kumar D, organising secretary and professor of OMFS and Dr Shankaranarayana P, Professor & HOD of Anaesthesiology were present. Dr Gayathri Bhat, Professor (American Heart Association (AHA) faculty in CPR training), Dr Sandhya B S and Dr Sushmitha Patil of Anaesthesiology and Critical Care, were part of the team. A total of 105 participants were trained hands-on in this life saving skill to be used in case of sudden stoppage of heart, which is becoming very frequent due to changes in life style. Whole gathering paid homage to departed ex-PM and tallest leader of contemporary India ‘Bharat Ratna’ Atal Bihari Vajapeyi. It was a fitting parting tribute the leader who envisioned, dedicated and worked relentlessly to the development of the country all through his life.